The family suggests memorial contributions be given to Kansas University Endowment Association, The Kidney Institute; Attention: Kelsi Remmert, 3901 Rainbow Blvd., Mail Stop 3018, Kansas City, Kansas, 66160. Curmit C. Casey, age 80, of Overland Park, Kansas, passed away on Friday, September 9, 2011. He was born in Strawn, Kansas, on March 18, 1931, to Olin and Agnes (Bland) Casey. He spent his early years in Cedar/St. Clair County, MO, residing in the Black Jack area. In 1952 Curmit moved to Kansas City and became an employee of General Motors Fairfax Plant, working in the trim department and emissions control. On February 12, 1966, he married his soul mate, Annadell Finke. He retired from GM in 1982, having been a loyal worker for 30 years. That same year Curmit embarked upon a second career when he joined the Dale Carnegie Training as a sales representative with the responsibility of forming new classes. He was 2nd and 3rd in personal production three years in a row! This was a superb accomplishment considering the fact that the Dale Carnegie Training is taught in 168 countries! He retired from the Dale Carnegie Training in 2002 having faithfully pursued what was his passion—serving others and helping them to reach their full potential. 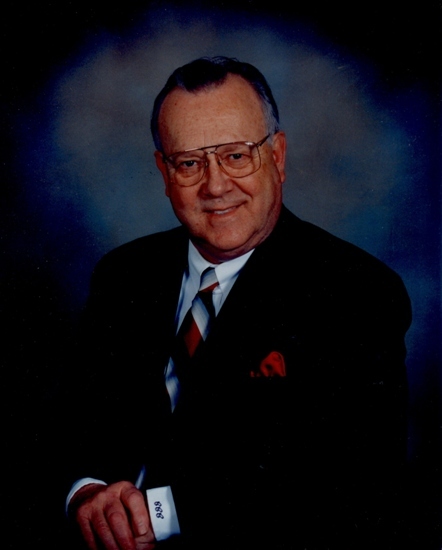 Curmit was a member of the Church of God (Holiness) and served on the board of deacons for many years. He had a perfect Sunday school attendance record of 46 years. He had a deep consuming desire to advance the kingdom of God by giving to missions. This was evident in the fact that he was responsible for having a church built in Chaine Moulin in the mountains of Haiti, a well dug in Africa, and the translation of the Bible from English to Spanish via the Bardales Spanish Ministry. The pursuit of travel was Curmit and Ann’s favorite pastime—having traveled to the Caribbean, Hawaii, Tahiti, China and Europe. Curmit was preceded in death by his parents, Olin and Agnes Casey; and his brother, Clemit Casey. He leaves his beloved wife of 45 years, Annadell Casey of Overland Park, KS; a sister, Wanda Casey of El Dorado Springs, MO; a nephew, Dr. Rick Casey of El Dorado Springs, MO; a nephew, Mick Casey of Forsyth, MO; a niece, Karen Casey of Hicksville, OH; two great nephews, Patrick Casey of Hollywood, CA and Scott Casey and wife Kristen of El Dorado Springs, MO; a great niece, Sarah Marcum and husband Jake of Fort Bragg, NC; two grandnephews, Trey and Talon Marcum, and two grandnieces, Taylor and Taryn Marcum, all of Fort Bragg, NC. Also surviving is his father-in-law, Paul Finke of Florissant, MO, along with many other relatives and friends. Curmit will be greatly missed as he was often heard to say, “I just love people,” and his many friends were a testimony to that fact. The family will receive friends at Bland-Hackleman Funeral Home from 6-9 p.m. on Wednesday, September 14, 2011 and the memorial service will be held at the El Dorado Springs Church of God (Holiness) at 2:00 p.m. on Thursday, September 15, 2011. Officiating will be Rev. Ernest Mullins, Rev. William Cook, Rev. Joe Trussell, Rev. Rene’ Bardales, and Rick Easley. Music will be provided by Barry Witt, Richard Beckham, and Marla Cook. Interment will follow in El Dorado Springs City Cemetery under the direction of Bland-Hackleman Funeral Home. Pallbearers are: Dr. Rick Casey, Mick Casey, Scott Casey, Brad Yager, Reggie Hamilton, and Rick Easley. Honorary pallbearers are: Gerald Bland, Junior Bland, Len Bland, Clayton Bland, Randy L. Bland, and Rene’ Bardales.